Wes Moss: How Do You Define Happiness? I’ve recently written a book about money and happiness called You Can Retire Sooner Than You Think (McGraw Hill Education, $18) which gives you a step by step guide to finding the right balance between money and happiness, so that you can retire early and happy. My book ultimately answers the question, “Does money buy happiness?” The answer is yes, but for a lot less than you might think. You should read it to learn about the financial bare minimums you need to achieve in order to be happy in America, along with the most important traits and behaviors that define happy retirees. For example, how many vacations do happy retirees take each year, what kind of cars do they drive, and how much money do they have saved? The steps, habits and traits that I outline in the book will help you retire sooner than you think. However, in reflection, what I truly learned from this project is that happiness is always a work in progress, and something we continue to strive for in our lives. I believe that happiness ultimately is about progress in all areas of your life. Your business or job, income, net worth, social life, your health, travel/experiences, sports, music . . . a radio show . . . are all only fun when you are getting better and progressing. In the business world we typically define progress as growth in the business. “We need to grow our business!” In reality, a business doesn’t necessarily need to grow to be successful; really the business just needs to consistently improve and progress in its original mission. Another example of happiness being a byproduct of progress shows up in the game of golf. Do you golf every week to get better or worse? When you walk away from the green with a higher score from the week before, golf isn’t nearly as fun. You enjoy golf when you shoot one stroke better, get one more birdie, or in my case, one less bogie. Here’s where the balance comes in, though. Progress is wonderful, but when progress in one area of your life causes you to ignore other areas, then your happiness begins to fail. Growing your income typically involves working more, which can translate to less family time or less time with your significant other. That is as surely a recipe for disaster as going in the opposite direction and spending all your time with your family and ignoring your job. Going to an extreme in either direction will leave you and your loved ones unhappy, so it’s best to find a moderate balance. Another example of being unhappy when unbalanced, would be travel. An old friend of mine came into a big chunk of money early in his life and decided to spend it traveling – for years. Now he’s in his mid 40s, he’s traveled all over the world, but he’s never held a job, never owned a home, has never married, and he typically crashes on friend’s couch. While it sounds like an exciting lifestyle, being a professional backpacker loses its luster after about age 21. A healthy lifestyle is something that we are all striving toward, but we still need to maintain a balance here as well. Dedicating three to four hours a day to anything is sure to cut into your life, and if you’re spending all that time running by yourself or at the gym, you’re missing spending time with your friends, family, even your job. Frankly, if you work out that much, you should really be getting paid for it. Bottom line, expand your horizons and make progress in all aspects of your life day by day. Including hobbies, sports, adventure, your finances, relationships, and even that trip you’ve been thinking about taking to Argentina or the Greek Isles. 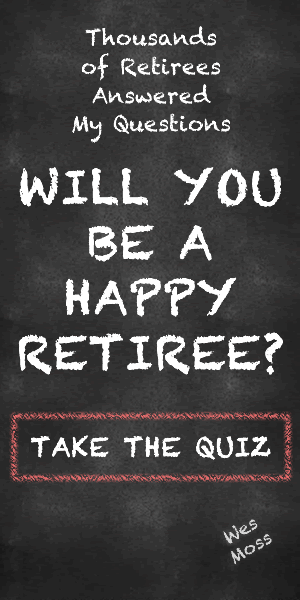 The happiest retirees find the right balance in all of these areas. For more information here a video link about my new book.